Item # 312325 Stash Points: 499 (?) This is the number of points you get in The Zumiez Stash for purchasing this item. Stash points are redeemable for exclusive rewards only available to Zumiez Stash members. To redeem your points check out the rewards catalog on thestash.zumiez.com. Add some color to your look in the Veil Mazarine Blue Crew Socks from Zine. 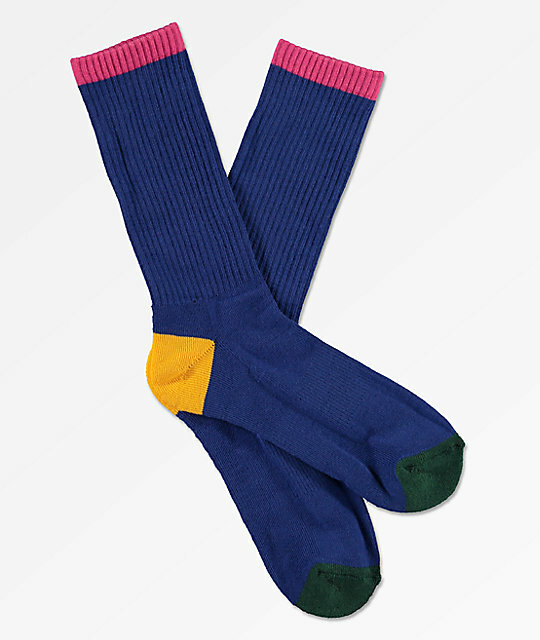 Coming in a unique colorblocked construction, these socks feature blue, yellow, pink, and dark green paneling throughout. A ribbed knit upper and padded heel, toe and footbed keeps things comfortable, making the Veil Mazarine Blue Crew Socks from Zine a must have addition to your sock drawer. Veil Mazarine Blue Crew Socks from Zine. Blue, yellow, pink & dark green colorblocked construction.